The Buffalo Public School District provides training for students with severe intellectual disabilities. Young adults 18 to 21 years of age attend the School 42 Occupational Training Center at the Tri-Main Building. WBFO's Focus on Education Reporter Eileen Buckley says students receive a variety of experiences to become independent and employable. 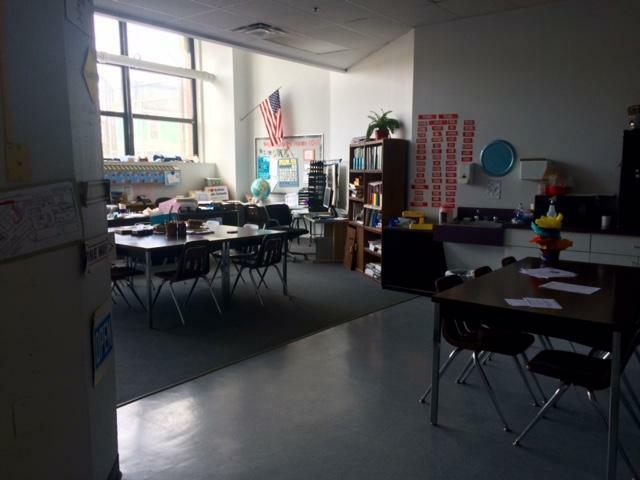 Inside one of the classrooms at BPS School #42 Occupational Training Center at the Tri-Main Building. WBFO's Eileen Buckley reports on BPS School 42 Occupational Training Center at the Tri-Main Building. providing students with severe intellectual disabilities a variety of skills. "They are students who don't take regular exams. They would fall under New York State Alternate Assessment," said Marie Wu, Teacher at the District's Occupational Training Center. Occupational Training Center at the Tri-Main Building working with students with severe intellectual disabilities. Wu refers to the Center as one of Buffalo's 'best kept secrets' for students that who unable to learn in a traditional classroom. "My biggest thing is if someone approaches you with a person with a disability, give them a chance,” stated Marie Wu, Teacher at District's Occupational Training Center. “We have kids with syndromes, we have kids that are just intellectually disabled, but there isn’t any syndrome, we have kids with Down syndrome,” explained Wu. The Center provides a place for students to learn 'daily living skills. They’re provided with community, vocational and job training. A classroom inside the Occupational Training Center at the Tri-Main Building. "And their biggest thing, at this point in their lives, is we are working on transition. What’s the next step? Once they leave here, at 21, they’ve graduated from the school system and they can get hooked up with adult service providers, so we try to prepare them for that next step,” said Wu. Like many of the city schools, there is a diverse mix of students who attend classes. Wu said many come from around the globe. “We have students from all walks of life. Our population is extremely mixed as far as backgrounds. We have kids from Somalia, from Burma, we have African American students, we have white students,” Wu said. Engaging students in activities strengthens their learning. A grant is allowing the Center to have a Neglia Ballet teach dance lessons to these students. It’s providing them with movement, exercise and ballet vocabulary. Inside the Occupational Training Center at the Tri-Main Building working with students with severe intellectual disabilities. Students take a ballet lesson with Neglia Ballet teacher. “Working with the students at PS 42, through Arts Partners for Learning, has been a really incredible experience for me as a teacher,” said Neglia instructor Sarah Keller Badger is teaching the basic ballet class and students have embraced it. It’s amazing to watch the students interact with Badger. They work to execute each dance movement that she demonstrates to them. Occupational Training Center at the Tri-Main Building working with students with severe intellectual disabilities. Students taking a Neglia Ballet lesson. “I don’t think I’ve ever had a class that has been so excited when they come into class every week. They’re excited, they’re engaged with the material, they’re having fun and laughing and fully participating,” described Badger. “Stretch, we work on being flexible,” said 17-year-old Markeis Payne. He’s is a student at the Center. Payne takes the ballet class and says he likes everything about it. Payne said this ballet class helps him and he hopes to someday have a career working with young children. “We do independent living where we cook and also learn about different food materials,” said Payne. “What do you like about coming here?” asked Buckley. “Field trips and getting jobs out in the community,” replied Payne. BPS Students at the Occupational Training Center at the Tri-Main Building learning ballet and stretching. “One of the most difficult things that I find with these guys is those soft skills, like knowing when to talk to somebody, when not to, knowing when to ask a question,” said Wu. Part of Wu's job is to give them Metro training. Students learn about using the Metro Rail and Bus for transportation and independence. Students travel to the Center and to on-the-job training. The Center’s teachers work to provide students with communications skills at their job site or in the community. Some also take speech classes. At the Center the staff is made up of classroom teachers and assistance, a music therapist, physical education teacher, home and career instructors and social worker. Wu tells WBFO News there are many challenges for the students, but with the right tools and training, these students connect with what they’re learning. “And I think sometimes people don’t realize that with the right amount of training, these guys can do a lot of things. They can get jobs, so my biggest thing is if someone approaches you with a person with a disability, give them a chance,” stated Wu.